News and info related to every occurrence of invest area 91L during the 2012 hurricane season. We now have invest area 91L which is situated in the Atlantic Ocean, not far off the coast of Cuba and well to the southeast of Miami. 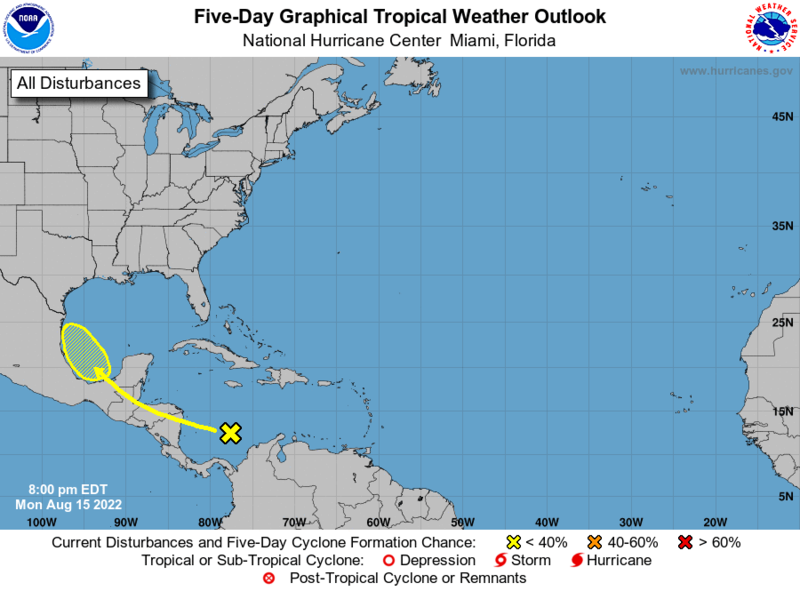 The NHC currently indicates a high chance of further development and it’s likely that we will see the system become a tropical depression and then a tropical storm before making landfall along the central Gulf Coast around mid-week. The main impacts will be squally weather and gusty winds for portions of Cuba, the central and northwest Bahamas and eventually south Florida, including the Keys. Water temps are plenty warm and there is abundant moisture available for the system to tap in to. The main inhibiting factor right now is shear – strong upper level winds keeping the tropical wave from organizing quickly. There are indications that this shearing pattern will relax enough for it to become a tropical storm at some point. Precisely how strong it can get remains to be seen. I do worry about these smaller systems since they don’t have to bundle as much energy and can ramp up quickly. As for the Gulf Coast, the main impact will be periods of very heavy rain and possible severe weather and the circulation closes in Tuesday and Wednesday. Along the immediate coast, the usual storm surge prone areas could see several feet of inundation, something we will have to wait and see about as time progresses. If you have travel plans across I-10 from Alabama through Louisiana this coming week, pay close attention to the forecasts and be prepared for delays. The potential exists for 5-10 inches of rain or more in some locations and this will make travel difficult at times. I will be heading down to the region beginning tomorrow for local coverage and data collection. I’ll take several of my live cams plus our two weather stations. If anything, this will be an opportunity to continue to test the equipment and if 91L becomes stronger than anticipated, I will be well positioned to know exactly how strong should that happen. You may follow along via our iPhone app, Hurricane Impact, just search for those exact words on the App Store. We had an Android version but it kept having issues and the cost to keep it going was too much. I will also embed the live vehicle YouTube feed on this page, in our app and on Patreon for anyone to follow as well. As for TS Florence, it’s not bothering any land areas for the time being but it’s worth tracking closely over the coming days as models are beginning to suggest it may not curve out to sea as originally thought. We have plenty of time to monitor the situation so no need to worry about Florence just yet. I’ll post an updated blog later tonight. Hurricane Bud in east Pacific will bring plenty of moisture to parts of SW U.S. The east Pacific has seen two category four hurricanes within less than a week. This is quite unusual and fortunately, neither will have major impacts on land areas. However, Bud, now weakening from its peak overnight, will bring tropical storm conditions, including the threat of heavy rain, to portions of the Baja peninsula and mainland Mexico. After this initial landfall, the remnants of Bud will move across Mexico and provide some relief from the heat over the Desert Southwest. With this relief will come the threat of heavy rain and maybe even thunderstorm activity would could set off flash flooding and even wildfires due to lightning strikes. I go over all of this, plus a look at invest 91L in the Caribbean Sea, in my latest video discussion posted below. It’s the middle of August and that means the hurricane season normally begins to ramp up as conditions across the Atlantic Basin become more favorable. I think that this season, however, things are going to be busier than normal and that may be a bit of an understatement. Right now we are tracking TS Gert well off the Southeast coast of the U.S. Top winds are 60 mph but Gert is almost certain to become a hurricane as it moves around the edge of the Bermuda High, eventually turning away from the U.S. The soon-to-be hurricane won’t part ways 100% quietly. Beginning as soon as later today, swells generated by the storm (and eventually what will be a hurricane) will begin impacting the coast of North Carolina and points north. This will be great news for surfers but for novice swimmers, children etc. it can mean disaster! I am not kidding about this, larger waves are indeed exciting to play in but they can lead to an increase in rip currents and the energy within the waves can cause physical harm when they crash on top of you. Be careful out there – this is not something to just brush off. As Gert gets stronger, the swells will get larger and this will remain an issue for several days. Next up we have invest area 91L out in the open tropical Atlantic which has a 60% chance of developing as of the 8am ET NHC tropical weather outlook. All in all, it looks as though the environment is conducive for this system to strengthen and become a tropical storm later this week. As of this morning, the guidance from computer models is divided between the ECMWF or Euro which is very aggressive with development and a solid west path across the Atlantic and other models such as the GFS which don’t seem to do much with the system. Considering the poor track record of the GFS this season, I am inclined to put more faith in the Euro for the time being. Perhaps once the envelope of energy associated with 91L consolidates and we get a closed low – then the other models will latch on and aid in helping to understand where this feature will track over the next several days. For now, it is out over the open Atlantic and not a threat to any land areas. I cover these topics and more in my video discussion for today which is posted below. As we begin the long holiday weekend, residents of and visitors to the coast of parts of the Southeast may have to deal with a tropical storm. This is not typical of Memorial Day weekend but this year, it looks like we will break the norm. The latest info from the NHC tells us that the area of low pressure between Bermuda and the Bahamas continues to get better organized, with a 90% chance of further development. That being said, it is hardly doing so at a rapid pace, this is not peak hurricane season with ample warm water around. As it is, we are essentially at the very beginning of the season and the amount of energy available is somewhat limited. As the low moves towards the warmer waters of the Gulf Stream, there is a chance for it to strengthen and it could become a tropical storm before reaching the coast. The other scenario is that the low remains loosely organized and resembles more of a subtropical storm with winds spread out away from the center. Most of the computer guidance, some of which simulates the structure of tropical systems, indicates that this will in fact become purely tropical in nature – meaning that there should be a well defined center with organized bands of showers and thunderstorms closer to that center. This is what most people are used to seeing and I think that is what will happen. Most of the track guidance suggests a landfall somewhere in South Carolina over the weekend. This means the obvious chance of heavy rain, some gusty winds and a churned up Atlantic. Beach-goers need to be especially mindful of local conditions – rip currents are part of the over all package of hazards that tropical systems bring with them. Do not underestimate the power of rough surf conditions, heed local surf advisories and keep the little ones very close to shore. As far as other impacts, it’s too soon to know how much rain and who gets it. Once the storm forms and models get a better handle on its structure, that info can be fine tuned. You can bet on some locations receiving a few inches of rain but this is not the set up that we saw last October when hurricane Joaquin was off shore, peeling off insane amounts of moisture. There will be potential for heavy rain, but nothing like what we saw last fall. The NHC mentions that the Hurricane Hunters will be investigating the low later today. Once we get the info, I will post another blog update here along with a video discussion for our app, Hurricane Impact, and on our YouTube channel. The area of interest off the Southeast coast, now known as “invest 91L”, is slowly getting better organized. The NHC has increased the chances of development in to the high category as we head in to the big holiday weekend. But development in to what, exactly? That remains to be seen. A tropical storm is what we are most used to hearing about. Winds are more or less concentrated around a well defined area of convection or thunderstorm activity close to the center. A subtropical storm is more like a hybrid storm that has some tropical characteristics while also displaying some non-tropical signs as well – such as having winds and energy spread out over a larger area and more loosely defined convection. In other words, a subtropical storm hasn’t quite bundled all of its energy around a distinct, warm-core center like we are used to seeing with purely tropical systems, especially hurricanes. Subtropical storms usually transition completely in to classical tropical storms if they remain over warm water long enough. In the case of 91L, right now, it remains spread out and not very concentrated, therefore, development has been slow. As long as this continues, we won’t see much more than a nuisance rain maker for the Carolina coast this weekend. However, water temps in the Gulf Stream, which is still to the west of the developing storm, are quite warm and it is possible that we will see a pure tropical storm form which would mean more wind, rain and rough surf conditions for the coastal areas that it impacts. The good news is that none of the model guidance suggests anything too strong coming from this. After all, it is only late May, not September. That being said, we should never ignore a festering tropical feature that is so close to land. If you have plans along the beaches from Georgia to Cape Hatteras, keep them, but be aware of this feature and the potential for heavy rain and some gusty winds. The other hazard that would concern me is rough surf. Water temps along the beaches are still sub-80F but this will not keep people out of the water this weekend. Watch for local conditions to change including the chance of increased rip currents. Remember, tropical storms have the potential to be deadly if people don’t understand the local impacts. Keep an eye on the kids if they plan on heading in to the ocean in the affected area during the long holiday weekend. I will post a video discussion concerning 91L later this afternoon followed by a blog post update here this evening.